Inspired by injectable hyaluronic acid fillers such as Restylane©. Smooth Surface™ Instant Line Filler silicone gel instantly blurs the looks of lines and wrinkles while helping your skin to remodel itself over time. 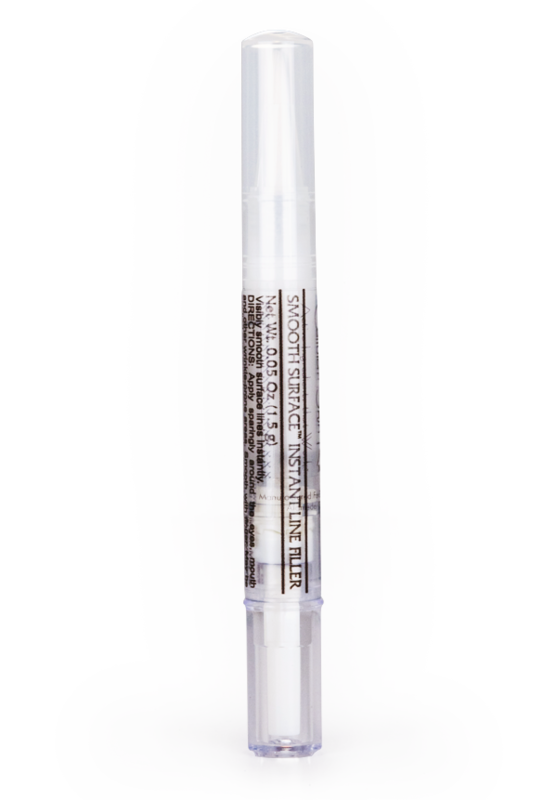 Available in both a small jar for fingertip application or as an easy-to-use portable pen applicator, this lightweight formula makes wrinkle-filling simple, quick, and discreet – anytime, anywhere. You can use Smooth Surface™ Instant Line Filler under or over-makeup throughout the day to keep skin looking fresh and smooth. How does this remarkable formula give your face that perfect glow? Holographic spherical technology reflects light away from lines and surface irregularities. Shadowy wrinkles, crow’s feet, laugh lines and enlarged pores immediately appear smoother, softer and more youthful. The same spherical technology allows dehydrated Hyaluronic Acid to absorb moisture so that lines and wrinkles are plumped from within the skin. As the hyaluronic acid swells, skin appears fuller and fresher, an effect that will last for hours. Additionally, clinically-tested Dermaxyl™, a patented oligopeptide/ceramide blend, encourages cell repair where skin damage is most concentrated. Over time, wrinkle volume is reduced up to 36% and the depth of wrinkles is reduced up to 27%. Tetrahexyldecyl Ascorbate, a potent Vitamin C ester also helps to boost collagen and inhibit MMP enzymes that destroy elastin in the skin. Smooth Surface™ Instant Line-Filler gives you great anti-aging results – instantly, within days, and over time. For best results, apply over makeup or moisturizer. For pen users, twist pen base until small amount enters the brush. Stroke lightly over lines and wrinkles. For plastic pot users, smooth gently with fingertip. Use at least twice each day for best results. Other Ingredients: Cyclopentasiloxane, dimethicone, polysilicone-11, polymethlsilsesquioxane, crosspolymer, polydodecanamideaminium triazadiphenylethenesulfonate, polyvinylalcohol crosspolymer, palmitoyl oligopeptide, ceramide 2, silica dimethyl silylate, sodium hyaluronate, tetrahexyldecyl ascorbate, C12-15 alkyl benzoate, tribehenin, PEG-10 rapeseed sterol, ethylhexyl palmitate, caprylyl glycol, citric acid. Use in conjunction with Perfect Skin Line-Diffusing Emulsion for an enhanced, perfected appearance in photographs. Use under eye make-up as a primer or over concealer to fill fine lines around the eye, especially crow’s feet. Please don’t ever stop making it!